Racy won over Riches. The boldness of the red was too much to ignore. 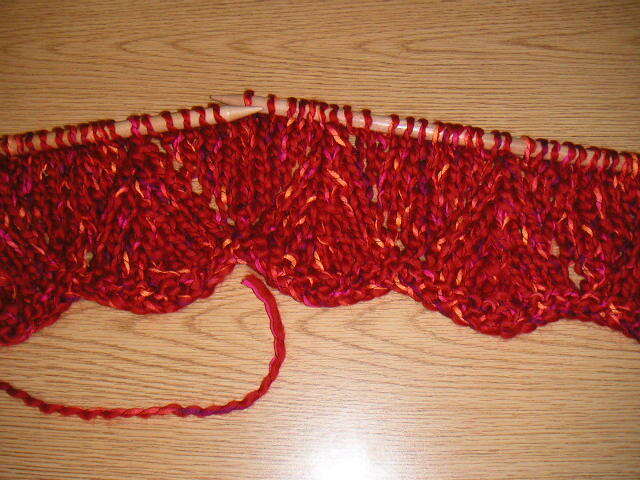 I also just happened to find some Racy for sale on eBay for about $5 less a skein than the retail price. You can't beat that. However, there were only seven skeins for sale and I needed eight to complete the project. So, I went over to my LYS to buy one skein to swatch and get started. I really like how this pattern is knitting up, especially the scalloped hem with the yarnover eyelet detailing. It's pretty!